Spray sunscreens – Spray sunscreens are super convenient (especially when you are trying to wrangle a squirming toddler or child who is way more interested in playing in the sun than protecting themselves from it) making them huge sellers on the market. 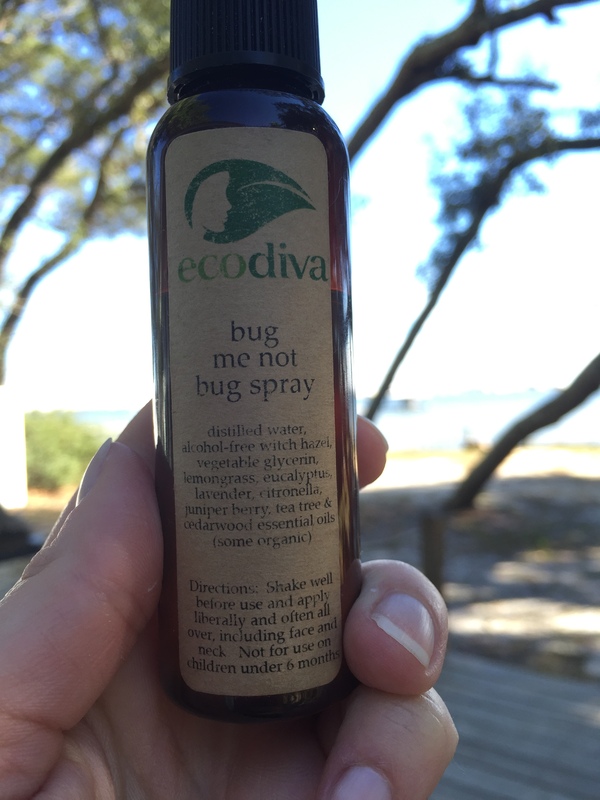 In fact, according to the EWG 1 in every 4 sunscreens on the market for summer 2015 is a spray sunscreen. However, these products don’t always cover the entire area effectively, resulting in burns, and also pose an inhalation risk, especially when spraying around small children. EWG states that the FDA has expressed doubts about the safety of spray sunscreens but as yet has not banned them. SPF above 50 – SPF 50+ sounds good right? We all want to protect ourselves, and our children, from the sun’s damage so we often grab a high SPF sunscreen because we feel like it adds extra protection. However, these sunscreens lull consumers into a false sense of security. SPF stands for “sun protective factor” and is an outdated term because it only applies to protection from the sun’s UVB rays, which is what burns the skin, but not against the damage from UVA rays which is what contributes to premature aging and cancer risk. According to EWG the FDA is considering banning any labeling of SPF above 50. Oxybenzone – Oxybenzone is a common active ingredient in commercial sunscreens, especially sport sunscreens. But this ingredient can trigger allergic skin reactions and worse, if it gets into the bloodstream it acts like an estrogen in the body. There is currently a great deal of research investigating the effect of Oxybenzone on the body and some preliminary evidence suggests that older women with endometriosis and young girls with low birthweights have higher levels of Oxybenzone. Retinyl palmitate – Retinyl Palmitate is a form of Vitamin A that is often used in sunscreen, lip balm, and night creams. Cosmetics manufacturers claim it helps skin look for youthful but government studies suggest that when used on sun-exposed skin this ingredient may actually speed up the development of tumors and skin lesions. The FDA has been investigating Retinyl Palmitate for years but as yet has failed to ban it from use in sunscreens. I found several DIY Natural Sunscreen recipes online. The first one I tried is listed below and it is modified from several sources, two of which I cited below the recipe. This is the one that I was wearing Monday at my little sister’s graduation. I really like that it is lightweight enough that I can wear it on my face without it feeling greasy – I spray once in my hand, rub my hands together, then rub on my face. It isn’t quite as readily absorbed as just coconut oil (which is what I was using as a moisturizer for the last several months) but did rub in and absorb relatively quickly. Just be careful not to over-apply if you are worried about it. My next project will be to make a body butter variation that will be easier to apply to the rest of my body. I haven’t decided exactly what recipe I will follow but I’ll make a separate post after I make it and let you all know how I like it! 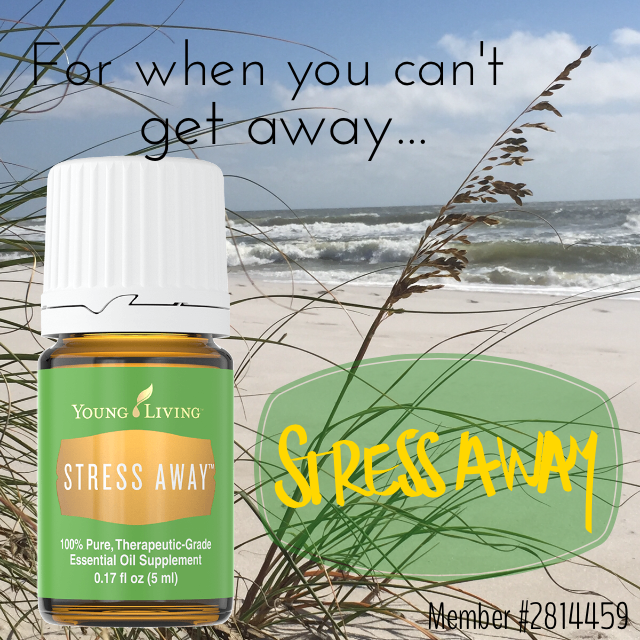 Mix together in 4 oz glass spray container. Spray mixture on hands and rub into skin avoiding eyes. Reapply often. 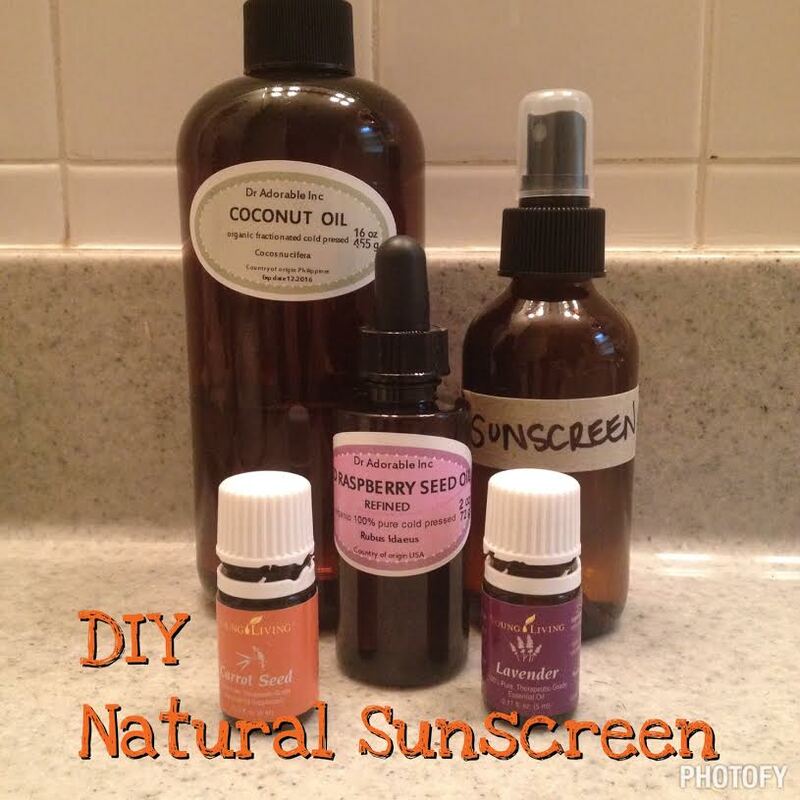 Want to know how effective my DIY Natural Sunscreen is? I had a chance to test it out for myself on May 11 when my little sister graduated from Emory University. It was a beautiful, cloudless day in Atlanta, GA – the perfect day for an outdoor graduation. I was super excited to try out my new DIY Natural Sunscreen recipe, sprayed it on my face and hopped in my car at 3:30 am. I knew I was going to be outside sitting in the sun so I made sure to wear a shirt with sleeves to protect my arms (and my ink) from direct exposure. What I had forgotten to account for was that my shirt had an open, mesh back and I had recently cut 14” off my hair that would have normally covered the upper portion of my back and protected it from the sun. As you can see in the above image, I burnt my back pretty bad that day but my face (with only one application of my DIY Natural Sunscreen several hours before) was not burned at all! It is a little flushed in the picture, which I took in a truck stop bathroom when I realized just how badly I had gotten sunburned, but by the next day there was no redness at all!!! I was thrilled (and motivated to find a sunburn remedy recipe!)!!! 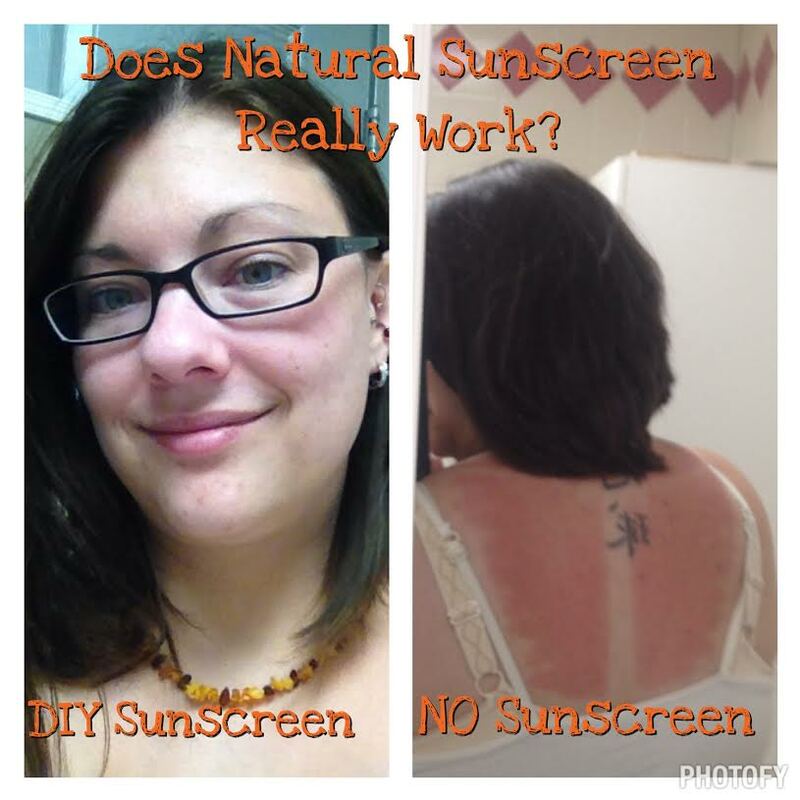 Don’t want to spend the time or energy to make your own sunscreen? In addition to the Hall of Shame list, the Environmental Working Group publishes a Guide to Sunscreen every year which is a wonderful resource to look at how your preferred brand of sunscreen stacks up against the best! Is is harmful to the environment? Does it contain toxic chemicals? Does it contain artificial color or fragrance which can be an allergen or skin irritant? Make sure you know what’s in your sunscreen! So there you have it! Get out there and enjoy your time with friends and family as you celebrate and honor the active duty military and veterans who have given their all to serve our country! But make sure to protect yourself from the sun!!! 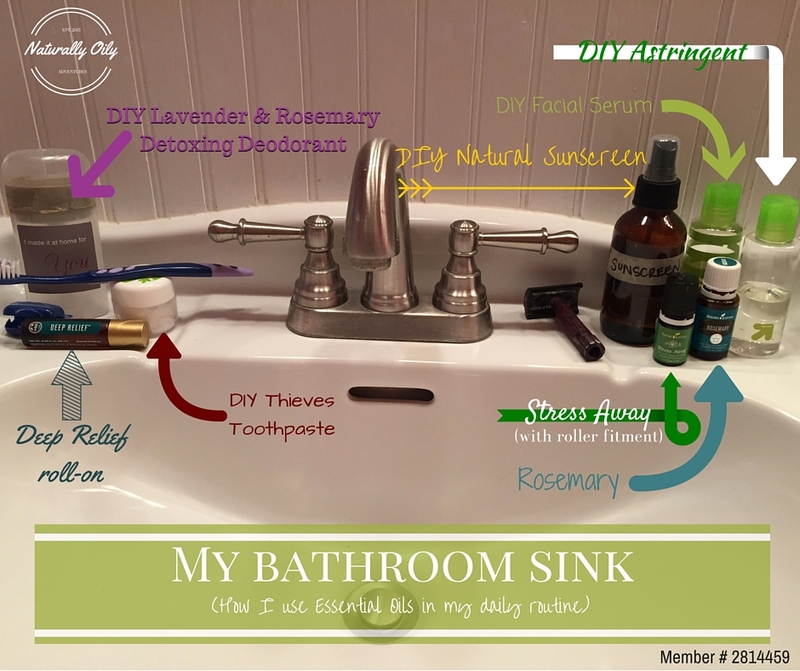 Categories: DIY Personal Care and Hygiene, Young Living | Tags: carrot seed, chemical free, coconut oil, DIY, essential oils, lavender, memorial day, natural lifestyle, natural living, non-toxic, raspberry seed oil, spf, sunscreen, young living | Permalink. *Note: Carrot Seed and SPF – It is commonly reported that Carrot Seed essential oil contains an SPF of 38-40. However, most of these posts cite (if they offer any citation at all) a study done in India that researched a natural sunscreen that contained Daucus carota and “other ingredients.” In this study, the natural sunscreen contained an overall spf of 38-40. However, Robert Tisserand (the man who literally wrote the book on essential oil safety) points out that the study most likely used a fatty carrot oil (infused or cold pressed vs distilled) rather than an essential oil as is commonly assumed. My French Aromatherapy class material states that it is the betacarotene in carrots that protects the skin from ultra-violet radiation. However, carrot seed essential oil does not contain betacarotene (it does not survive the steam distillation). Betacarotene is only found in the edible carrot root. Because it is fat soluble you can make a macerated carrot infused oil that might have some spf and could be used as a carrier oil for skin care. While I personally did not burn using the following sunscreen recipe, it is most likely due to the low spf of the coconut oil combined with the red raspberry seed oil that protected my skin. 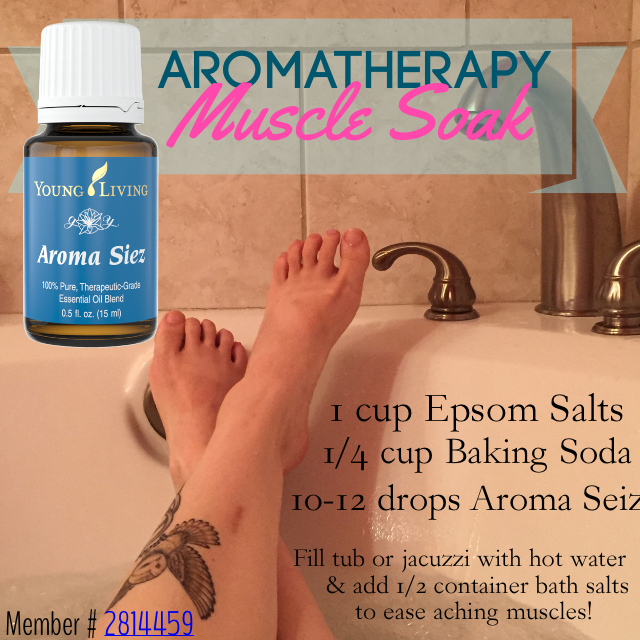 5 drops of lavender oil for sunburn protection – I only use Young Living brand essential oils! 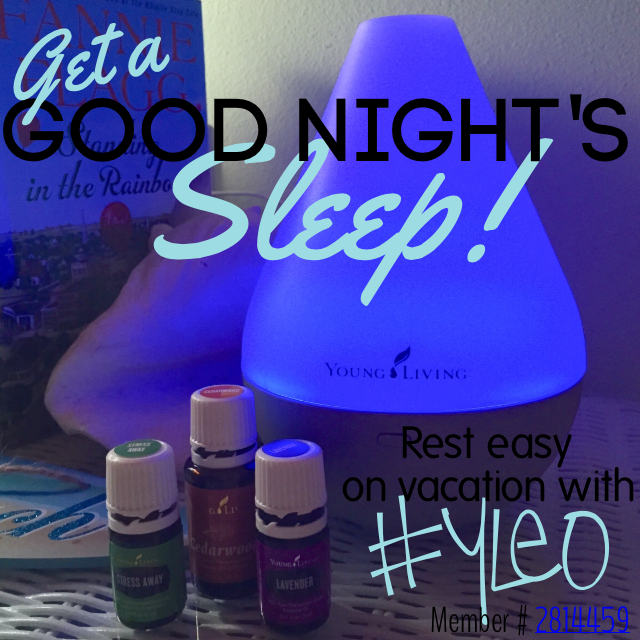 Contact me for more information or find out how you can get wholesale pricing on essential oils!